Portsmouth Branch of the Historical Association: a Partial Synopsis. Portsmouth's Branch "Minutes Book No. 2" of the years 1946 -1981 is in the city Record Office. It records a Jubilee Dinner held in 1974: so the Branch was founded in 1924. Sadly, no "Minutes Book No. 1" has come to light. From 1932 one of the Branch's chief forces was Dr. Dorothy Dymond, Principal of Portsmouth's Teacher Training College for the next 24 years. She continued to attend lectures into her nineties and even then would enliven meetings with a perceptive question which opened up a new debate or exposed an untenable thesis. It was under Dr. Dymond that the Branch "re-opened" in June, 1946 at the College in Milton, Portsmouth, where the students went to "considerable trouble" with the refreshments, before an audience of eighty heard the inaugural lecture on Poland, given by Prof. W.J. Rose of S.E.E.S., London University. Dr. Dymond explained the aims of the HA and notified intending members that a temporary committee had formed a "caretaker government" until proper elections could be held. A "rough programme" of lectures and study group meetings was outlined. On 9 July, 1946, a Study Group Committee met under Mr. D. D. Lindsay [headmaster of Portsmouth Grammar School] and the theme was set as "The Effects of Puritanism upon English Life". Eight meeting dates (three in October alone!) and titles of papers were given, though some speakers were still to be asked - including Dorothy Dymond herself and a newly-appointed (unnamed) teacher to PGS! [He turned out to be E.S. Washington, who was expected to talk on "Natural Science and Philosophy". He later collaborated with David Lindsay in the writing of an excellent school textbook.] There is no evidence that the prolonged bad weather of that winter had any effect on meetings. The study theme for 1947-48 was "The Making of the USA". A plea by HA Council for some fund-raising was circulated to individual members, but the Branch was unwilling to make any group effort by means of a pageant or exhibition. In 1955-56 a recommendation from Council to double the annual subscription from 7/6 to 15/- was felt by the Branch to be "larger than necessary", though Dr. Dymond noted that headquarters had to meet increased printing and postage costs. The Branch minuted in 1960-61 that "a balance of 3 visiting speakers and 3 members should be maintained if possible" in the annual lecture series. It is interesting now to note how many Branch members in the years after 1946 did indeed lecture to their colleagues. The lectures held in the College were colourfully advertised in displays for each topic by students of John Webb. In 1978 meetings moved to the Record Office, a fitting venue, but the Record Officer, Sarah Peacock, herself a fine historian, found she was hosting too many local societies. Briefly we were in the Central Library, in a room that was only screened-off. This gave us problems each time: at month three our speaker's remarks were punctuated by ‘Alleluias' from a revivalist meeting. We fled. For another decade we met in St. Luke's School library, and then in St. John's College staff-room. For the last decade and a half the University has been a kindly host in the Park Building, courtesy of historian Dr. James Thomas, the Head of the School of Languages and the Vice-Chancellor, Professor John Craven. The format has remained the monthly evening academic lecture. The season used to extend from September to June, but to fit the university semesters and reduce costs, now runs only from October to May. The Branch was fortunate for many years to have first John Webb, head of department at the Training College, and later Robert Cecil as members. They were able to step in, when a lecturer had to cry off, with stimulating lectures of their own - even at 7.30 p.m.! Robert had studied in Germany in the 1920s before joining the F.O. and was very enlightening on the inter-war years. We also had John Symonds who, for 28 years as Programme Secretary, produced many thoughtfully varied series of lectures. He is still serving, as our Chairman, and Mary Kinoulty has taken on the challenge of the programmes very successfully in the last four years. We recall some first-rate lectures. Other branches must have enjoyed Hugh Baker's "Of Feet and Opium" as much as we did: by turns, hilarious, poignant and hard-hitting. There was Tom Holder's "Erotics around the Corner, Sir" after his visit to some of India's temples. [Tom, from Southampton, has long been a good friend to our Branch.] And there was the thrill of sitting alongside one lecturer in the 1980s as he referred to his (medical doctor) grandfather's journal, kept during the Boxer Rebellion as the embassy was besieged: the handwritten immediacy of it - right there, in front of us. The summer outing was once a regular feature. The first post-war was to Winchester Cathedral library, where members were given detailed explanations of several illuminated manuscripts. The last long-distance one was to Chartwell, though the Branch did visit Silchester at Prof. Fulford's invitation, after his lecture to us on the recent research there. Other proposed distant outings have failed for lack of support, but two on home ground were true eye-openers. One evening, Branch members were taken into the Victory's hold - before it was refurbished and opened to the public. The vast emptiness conveyed the enormity of stocking a Nelsonian first-rater for years at sea quite as vividly as the reconstructions which now fill that space. And in 2009 the Branch was given a tour of Fort Cumberland. This huge, yet almost hidden, piece of Portsmouth's shoreline, part of the defence that ringed the docks against the threatening French (sic!) is sadly underused. Some lateral thinking is needed for it. 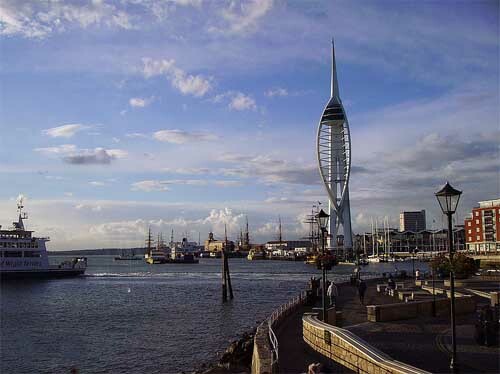 The Branch marked the 75th anniversary of the HA with a formal dinner at Portsmouth's renowned Queen's Hotel, when the speaker was Prof. Roger Lockyer of Royal Holloway, London University, and former tutor of Portsmouth's then Record Officer. We celebrated the HA Centenary with a special evening visit to the Mary Rose and its museum, complete with buffet, quiz (and prize! ), and lecture by David Childs of the Mary Rose Trust. Between the mid-1970s and late-1990s, the Branch organised about four successful Sixth Form conferences, all on 20th century themes. And under Dr. James Thomas of the Social Studies department of the Polytechnic/University, seminars ran parallel to the monthly lectures, in which students of his Local Studies course, and others from further afield, read papers of their on-going research. The seminar series, lasting several years, gave many contributors a first public platform for their work. Dr. Thomas himself has twice served as our Chairman, two decades apart, and has given us numerous lectures on many aspects of the Navy, the East India Company, the Dockyard, Portsmouth itself and Hampshire's history - always filled with wit, ironical humour and enlightenment. Dr. Thomas also introduced a new feature at one AGM. Members were asked to bring along a significant family artefact and talk about it. This step into personalised history was very satisfying - as well as one of the best-attended AGMs! Another James, McInnes of Havant College, was then our Chairman and he invited us to join him in the transcription of wills and inventories of the people of Portchester from the early 16th to the 18th centuries. Hampshire Record Office provided photocopies of about 250 documents, which were paid for by a generous grant from HA headquarters. James taught us to read them. He did 90% of the work; a steadily shrinking group of volunteers did the other 10% - and the result was a fascinating insight into a community very much sui generis. A copy of these transcripts has now been placed in the Hampshire Record Office in Winchester, and we have had the benefit of Dr. McInnes's conclusions in his lecture on the people of this unique manor. One feature of Portsmouth HA is that a committee member will, if circumstances permit, entertain our lecturer for a meal at home. Apparently this is not general, and our visitors often voice their appreciation of this gesture. Occasional "over-nighters" are likewise offered a bed at a member's home, rather than packed off to an hotel. Portsmouth Branch has much to be proud of in its 87 years. The committee greatly appreciates being able to meet regularly at the home of Wendy and Peter Smith - for so long now that it has become a tight-knit working group. Current associate membership is as good as ever, though we could wish to see more full members of the HA. We welcome those who turn up casually to our meetings. The compact lecture theatre which the University generously makes available is an excellent venue. We conclude this synopsis by thanking all the speakers who have been willing to travel to us at minimal cost, often on miserable winter evenings, over so many years. We know that HA headquarters itself is under great constraints and are grateful for the contacts it gives us through its list of available lecturers and the support it provides. February, 2011. Richard Hill Brown, Committee member since 1981; former Branch Treasurer; former Chairman.